Jaguar isn't wasting any time following the recently released roadster with a coupe variant. A few days ago we presented renderings that purported to reveal the F-Type coupe. Jaguar has since claimed that the images were in fact of the C-X16 fixed-roof concept revealed at the 2011 Frankfurt Motor Show. 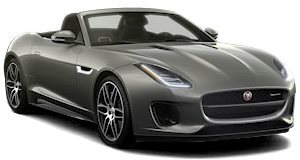 It was an easy mistake to make as it’s no secret Jaguar has imminent plans to roll out the coupe variant of its new roadster. And these latest spy shots show that the British carmaker is well on its way to introducing the first of many new derivatives of the F-Type. Apologies for the lack of picture quality and no rear shot, but our spy photographer snapped the production-ready coupe prototype through tinted glass while hiding in the boot of his SUV. Security was apparently out in full force the day Jaguar took the car out for a spin. The roadster’s trio of supercharged powertrains will likely carry over to the coupe, but Jaguar is also expected to offer additional engines to accompany the 340- and 380-horsepower V6s and 495hp V8, with R, R-S and even R-S GT variants alleged to be in the works.